This was the most labor-intensive part of the restoration. 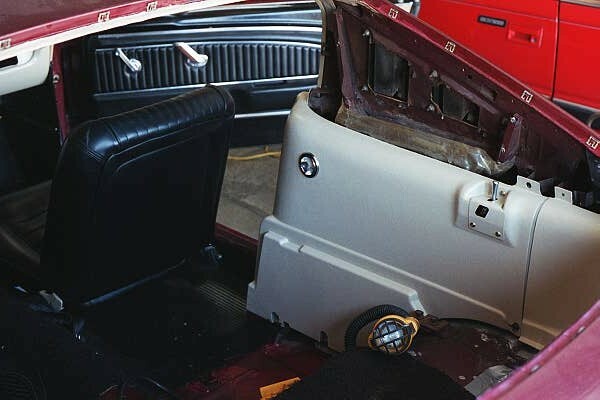 The fastback trim panels are made of molded fiberglass and because of their age, are somewhat fragile. The dilemma facing me initially was how to remove the black paint while preserving the original paint underneath. Steel wool and lacquer thinner did the job initially but this was slow and tedious. And, I was worried about cracking a panel from all the handling and scrubbing on it. Follow the pictures to learn how I tackled the problems. Right away, I knew the die cast air extractor grilles would have to be removed if this job was going to be done right and look right. Note that the previous owner didn't specify this when the black paint was applied! Along the normally hidden bottom edge of the panel is where I experimented with DupliColor paint stripper to remove the black. 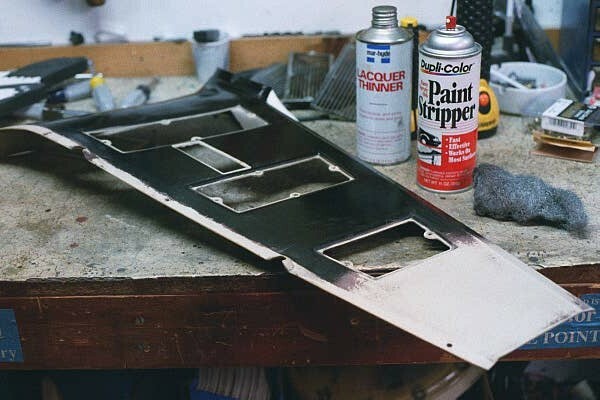 Ever mindful of the horror stories of stripper and fiberglass, I used it sparingly and let it sit only long enough to lift the black paint. Achieving success, I removed the remaining grilles and started work on the whole panel. 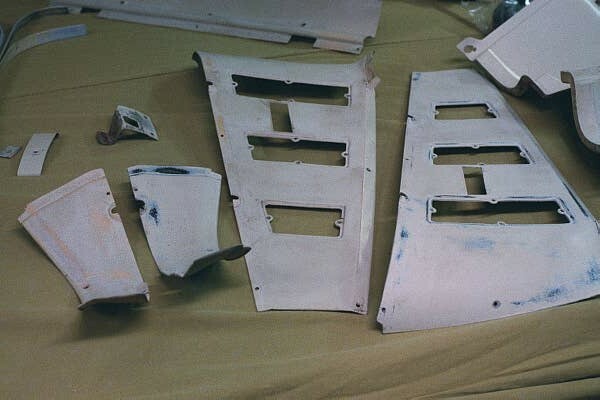 The grilles were removed by using a dremel-type tool and old dentist bits to grind away just enough of the inside peened-down stud to free the grille. Here's one of the air extractor panels with only a little of old paint to remove. The painter applied a dark brown primer over these panels before spraying the black. The original factory parchment paint was as tough as nails and resisted removal attempts from scrubbing or stripping. Steel wool was used to feather the edges. Assorted parts and pieces ready for primer and/or parchment paint. Some of the "beltline" moulding pieces had corrosion on their inside faces. They were cleaned up and treated to a light coat of POR15 before painting. I included this picture to show dissimilarities between right and left side pieces. The LH extractor panel and RH upper corner trim panel appear to have a black basecoat on them topped with a gray primer followed by parchment which was covered by black!.. No explanation for this observation other than they might not be original to this car. The painting begins. Here the LH extractor panel is wearing a new covering of parchment. I found that primer was not necessary on smooth fiberglass panels except for one piece that I used glazing putty on to fill a deep scratch. Textured panels especially didn't require any primer. Paint preps consisted of a wipedown with brake cleaner followed by a tack rag. Here's how I refastened the air extractor grilles. Before putting in the grilles, I carefully ground each pin so that the top of the pin would be marginally wider than the shank. I then used a titanium epoxy and smeared a layer around each trimmed pin and the side of the grilles, leaving the pieces sit overnight. The result. Not too shabby! The large quarter trim panels were a chore to do. 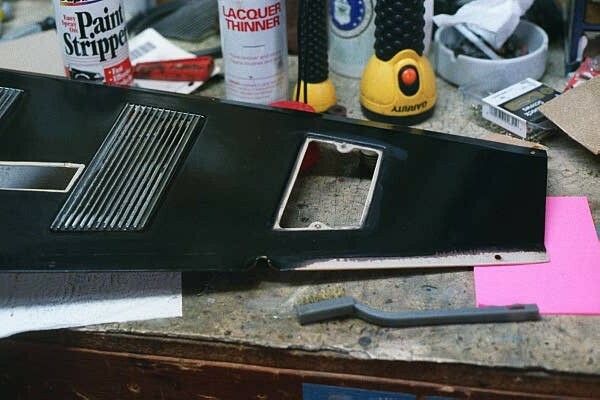 Using stripper, the bulk of black paint was removed with clean up done by lacquer thinner and brushes. There was no primer to remove. In fact, none of the textured panels were primered before spraying black. I also found it was all but impossible to remove the original parchment paint. Courtesy lights were removed, cleaned, and lenses replaced. The black accent ring was also repainted. These panels are ready for installation! Let the fun begin. First to go back in are the lower corner trim pieces. These are retained by two rivets (three once the center section is installed). I also added additional securing screws which the factory didn't include. 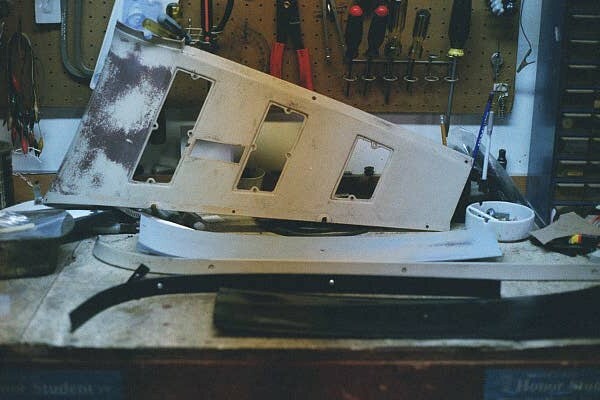 Next are the large forward quarter trim panels with the courtesy lights. Before installing the RH panel, I attached the seat back latch cover using new screws, washers, and speed nuts. These proved a tad difficult to install because the bracket welded to the inner wheelhouse wasn't placed properly and the factory had used lag screws instead of the correct bolts. Gettin' there. After the glass was put in, the air extractor sliding valve and the upper trim pieces were installed. This process took the most time because all the panel supports had been removed for glass installation and now had to be realinged to the panel screw holes. Looking at the LH side before the air extractor trim panel is fastened in place. 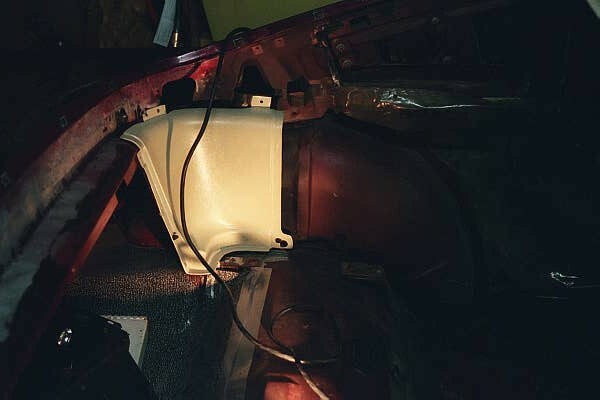 After both extractor panels were in, the large metal upper garnish trim pieces were installed. Here's where it paid off to have screws installed before the headliner was put in. 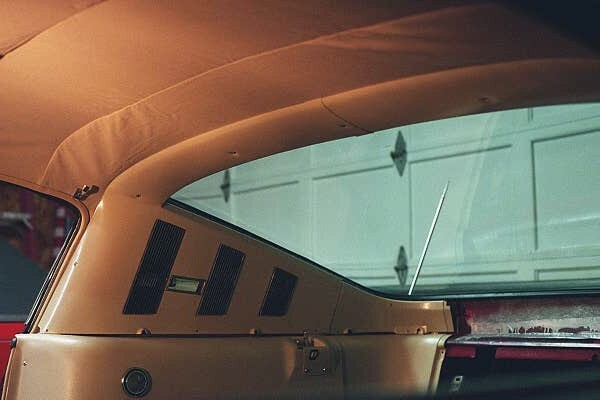 To find the screw holes, all you have to do is feel for the screw head, cut a small hole and push the headliner down over the screw head, remove the screw, and you're all set to properly faster your finished trim! The center trim section is retained by three rivets and three screws. The two end rivets also go through the lower corner trim panels so make sure you use long rivets. 3/16" is the diameter for the rivets. This was the only trim panel that had a break in it which I was able to repair, but failed to document for this page. Trapdoor hinges are also installed. BTW, the hinges are painted the color as the door. 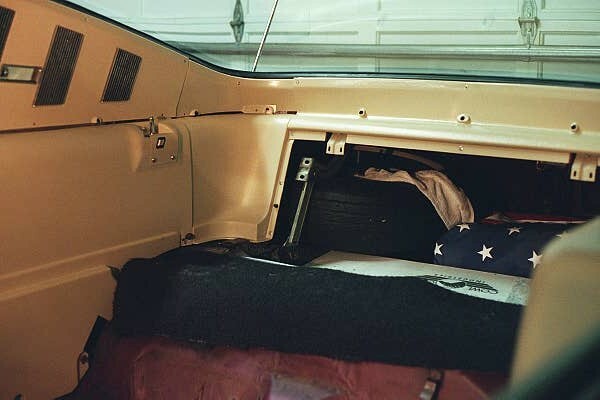 With the trapdoor installed, here's what the view from the trunk should look like. The entire trapdoor, inside and out, is painted the predominant interior. 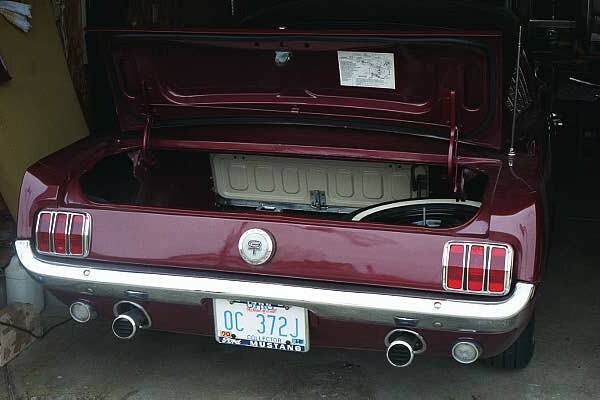 So in my case, the trunk side of the door, like the engine compartment part of the steering column tube, is also parchment. TA-DA !!! 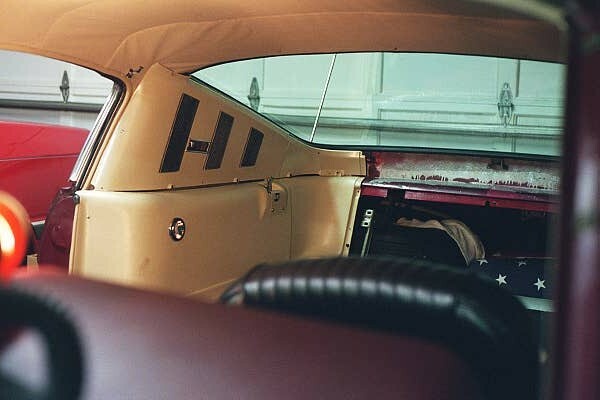 This is what a correct 1966 D3 and F3 fastback interior looks like. Ignore the just visible corner of the black front seat. Weren't enough funds to do everything at once. 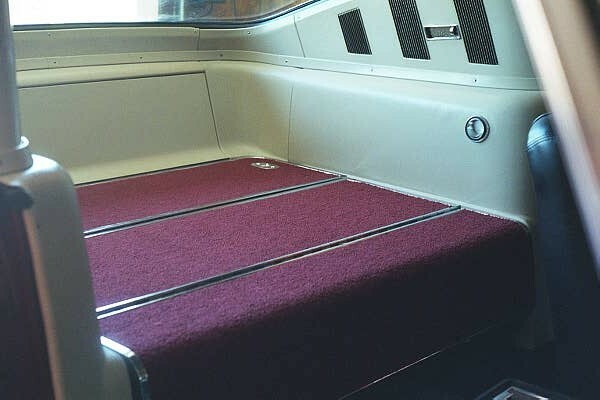 Left to do are the seats, kick panels, carpet, doors, and door panels. The expensive stuff.